Shur-Dry Flexible Water Blade. 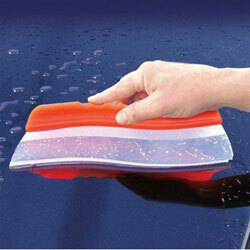 Easily molds to curved boats and vehicles, drying any surface in 1/3 the time. Eliminates water spotting without chamois and towels. The Shurhold Flexible Water Blade removes water quickly, cleanly, and efficiently. It will mold itself to almost any contour, and dries the surface in one pass. The combination of the flexible handle, flexible silicone blade, and the patented T-Bar edge makes the Shurhold Flexible Water Blade the ULTIMATE versatile and efficient drying device available. Virtually eliminates messy chamois and towels.